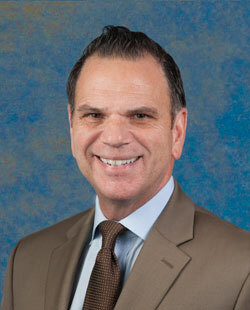 Dr. Bouchlas was born in Tampa, Florida and graduated from Duke University with his BA in Psychology. He then went on to receive his medical degree from St. George’s University School of Medicine. He completed his medical internship at St. John’s Hospital in Detroit, Michigan and his Physical Medicine and Rehabilitation residency at George Washington University in Washington, D.C. where he also served as assistant to clinical professor. Dr. Bouchlas is a Fellow in the American Academy of Physical Medicine & Rehabilitation, and a member of the Florida Academy of Pain Medicine. He is also a member of the American Academy of Pain Medicine, the Florida Society of Interventional Pain Physicians and Society of International Spinal Injection. Dr. Bouchlas has also co-authored several publications in the field of spinal injections and is actively involved in the training of non-surgical fellows at Florida Spine Institute. Dr. Bouchlas’ expertise is in the diagnosis and treatment of musculoskeletal, joint, and spinal conditions utilizing non-surgical treatments.